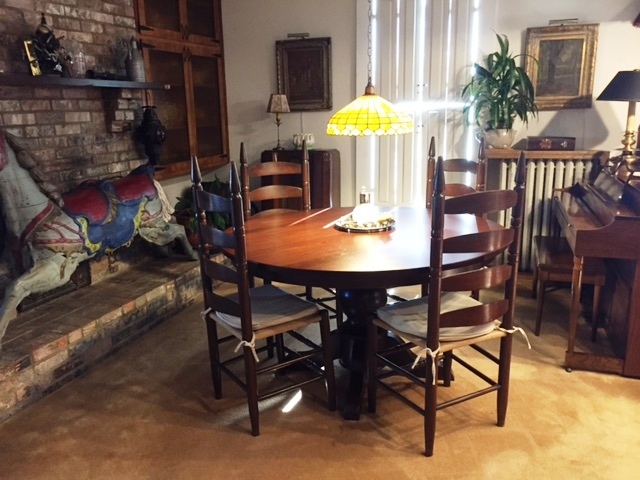 Anna from Virginia got a Carson Single Pedestal Dining Table for her World’s Fair era dining space. She chose walnut with the Acres stain for the 54” smooth top. The round table top and turned pedestal rest perfectly in the midst of her spindle chairs. “At last I can seat six the perfect number for dinner table conversation—around a spectacular table. It is a beauty, and I am enjoying it so much. Many thanks! 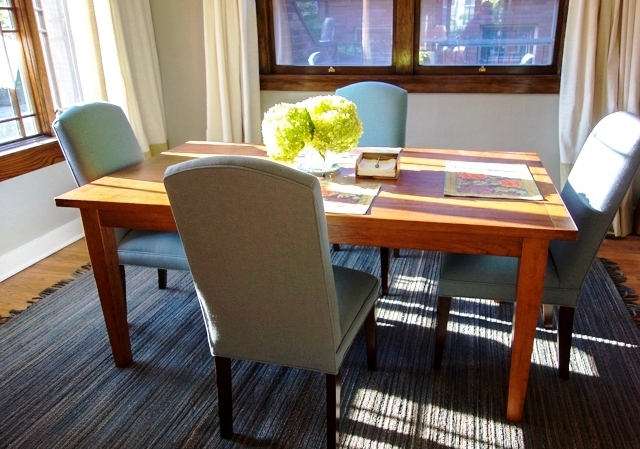 “We did a great deal of online searching for just the right table for our space and the table we ordered is perfect. The color selection ties in very well and we benefited by having several color samples sent to us. Our day to day use is what you see in the first picture. The Modesto Bench also takes leaves so it can expand with the table. Victor ordered two leaves with his 48” bench. 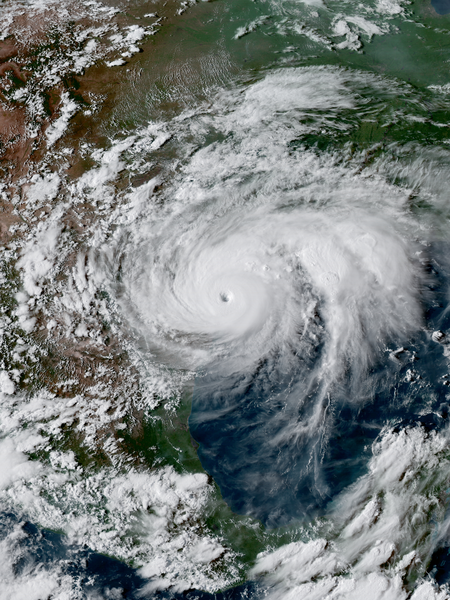 On August 27, 2017, with the remnants of Hurricane Harvey dumping 55 inches of rain on our hometown of Dickinson, Texas, our home was inundated with 16” of flood water. We experienced extreme losses with the majority of our possessions, including all of our furniture! After several days, turned into weeks of removing wet furniture, appliances, clothing, files, cabinets, flooring, sheetrock and insulation, we decided to allow our thoughts to drift to recovery plans. We knew that it would be a number of months before our house would be completed to the point of taking delivery of furnishings. But for therapy, we decided to shop around for furniture. There was a local (3rd party) store, in Houston, running a sales promotion on their name-brand adjustable beds. If after the purchase of one of their beds, the Houston Astros won the World Series, they would credit you the purchase price of your bed, or give you a 150% percent in-store credit. So we went and checked out the beds. They were nice! While we were there, we decided to look at their collection of Amish-made furniture. (My wife and I had for a number of years considered handcrafted, solid wood Amish furniture, but had only gotten as far as on-line “window-shopping”.) 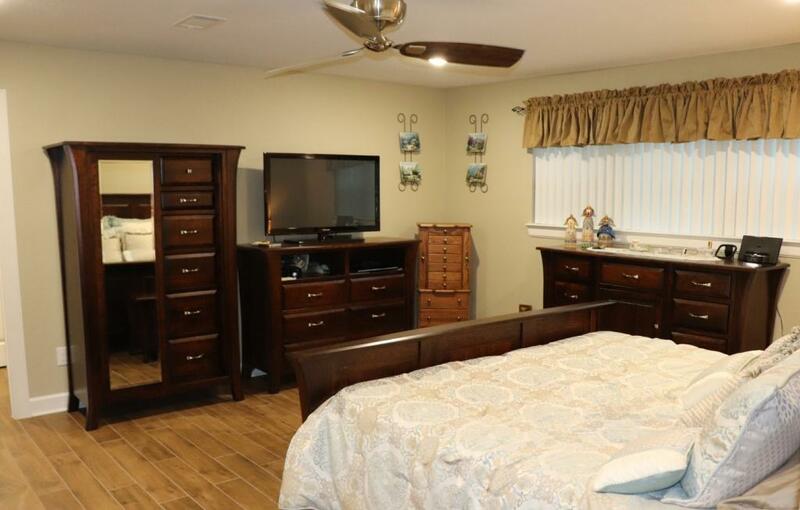 Well… we absolutely fell in love with the Ensenada style bedroom set. The Ensenada, with its smooth lines, rich grain of the Sap Cherry wood, along with the contrasting brushed nickel hardware, was impeccable. We took plenty of notes and pictures, as we put together our bedroom wish list. We decided to take our chances and purchase the adjustable bed. We had to take immediate possession, so we stored it with a “non-flooded” family member. We continued to watch as the Astros proceeded to win throughout the playoffs, and to our good fortune they won the World Series! Knowing that our in-store credit, at the Houston store, while wonderful, would not be enough to purchase our entire wish list, I began to comparison shop on-line and found Amish Furniture Factory. After a quick search, I found that they had the identical Ensenada style bedroom furniture. I initiated an account and started a “working copy” order. To my delight, I found that a seasonal discount was available, as well as an additional volume discount. As I searched the AFF website, I discovered that a number of options were available for several of the individual furniture pieces (that were not available at the 3rd party furniture store in Houston). For example, a dresser without a mirror, a larger chest of drawers, as well as a cedar chest and file cabinet were all available in the Ensenada style. 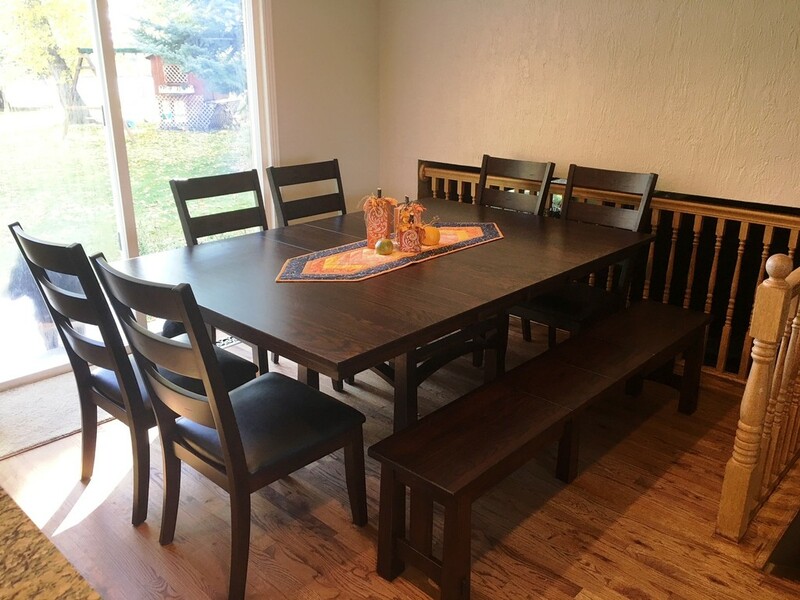 In February of 2018, I placed an order for several pieces of the Ensenada furniture. The next day, I received a call from Laura, at AFF, to discuss the details of my order. I explained that my home had been flooded and that I was attempting to match the furniture that I had won from the 3rd party store sales promotion. Laura was quite helpful in discussing wood types, stains and hardware. I provided her the wood type and stain name and had a picture of the hardware I was attempting to match. Laura was diligent at working with me over the next few weeks to achieve a furniture match. She provided me with a stained Sap Cherry wood sample, the stain name and manufacturer’s product number and part numbers for the brushed nickel hardware. Upon comparison of the wood sample to the actual furniture, it appeared we had a very good match. In June of 2018, our home was finally complete enough to take delivery of our furniture. I called to let Laura know and she gave me details of my delivery. We first took delivery of our 3rd party furniture, and within a few days, our AFF furniture was delivered. As can be seen in the photos, the furniture was a perfect match! 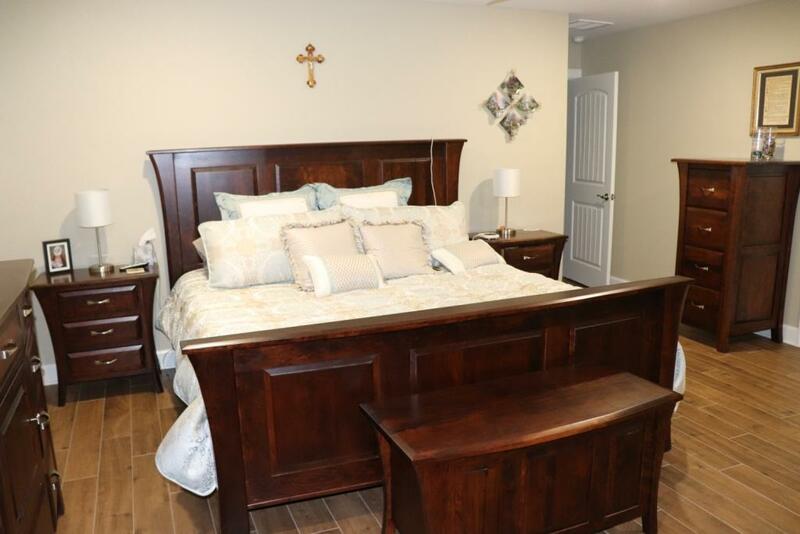 We couldn’t be happier with our Ensenada bedroom furniture. A big thanks goes out to Laura and the Amish Furniture Factory for helping make our recovery a pleasant experience. 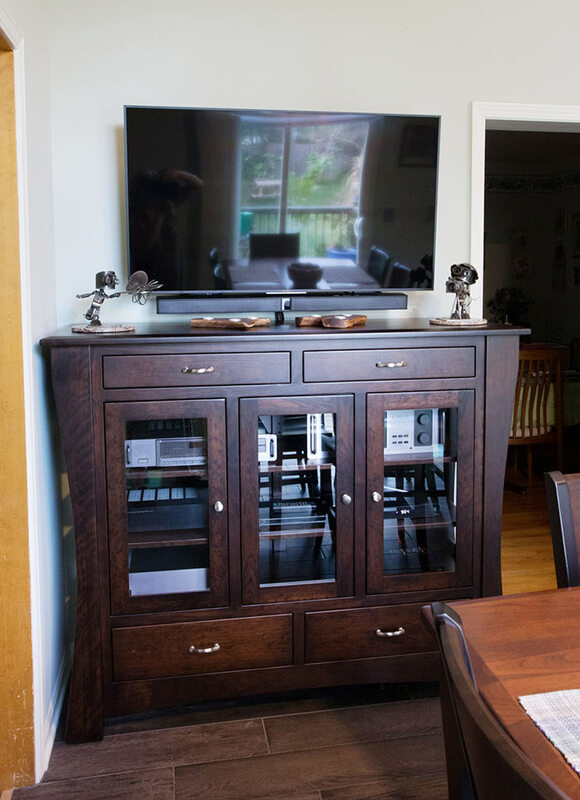 “I was in the process of remodeling my kitchen and had found the perfect two-tone tall table and chairs and needed a stereo/media cabinet to match. 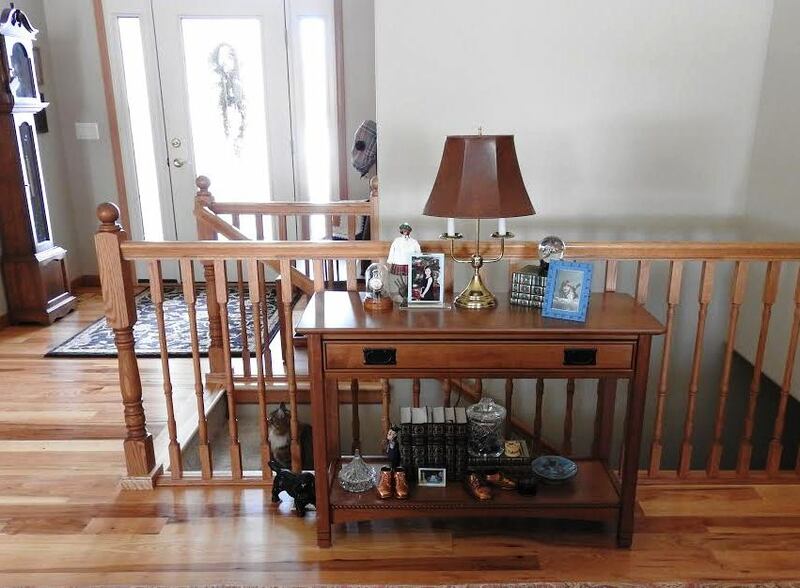 I found a beautiful tall buffet on the Amish Furniture Factory website that was the perfect width but there were two things that I wished were different. The darker stain color I needed was not listed as available and I needed two wooden shelves instead of one glass shelf. “I e-mailed Laura and she helped me solve both problems! I was able to find out the exact stain from the other company and Amish Furniture Factory obtained it and the furniture matches beautifully. They also were willing to replace the glass shelf with two wooden ones and drill cord holes in the back for me. There’s endless variety in handcrafted furniture. 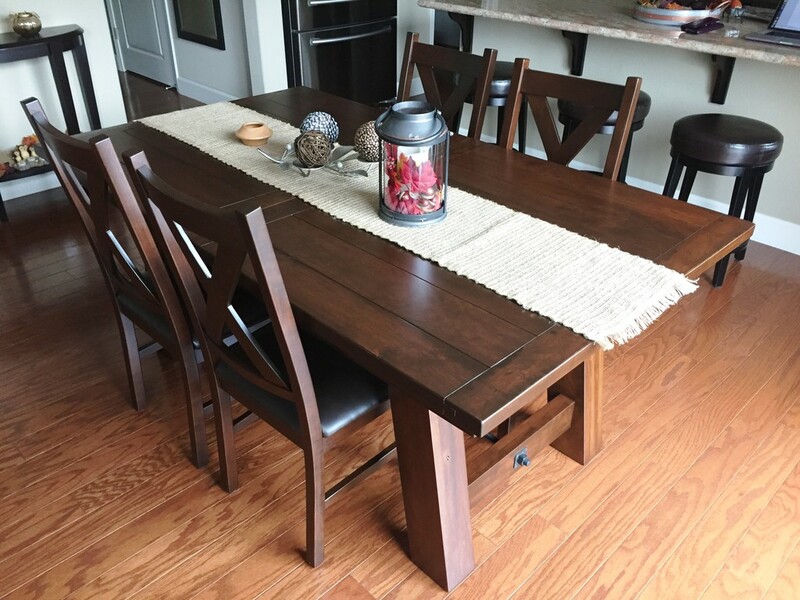 Anna mixed and matched this Ouray Dining Table with the Kenwood Dining Chairs to create her own gorgeous dining set. 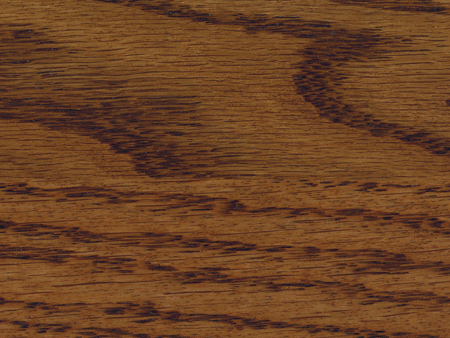 The wood is rustic cherry with coffee colored stain. The upholstery is faux leather in Asbury. 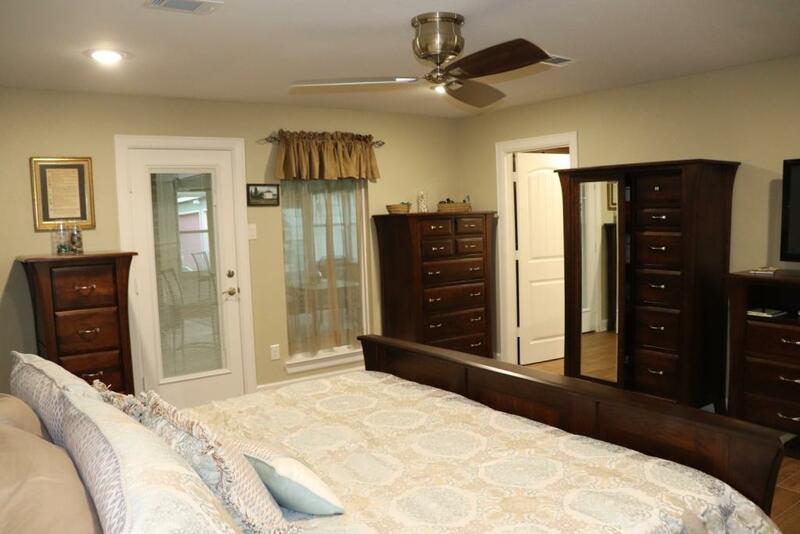 “It was such a pleasure to work with Laura at the Amish Furniture Factory. We purchased the Jacoby Plank Dining Table, which is absolutely beautiful. 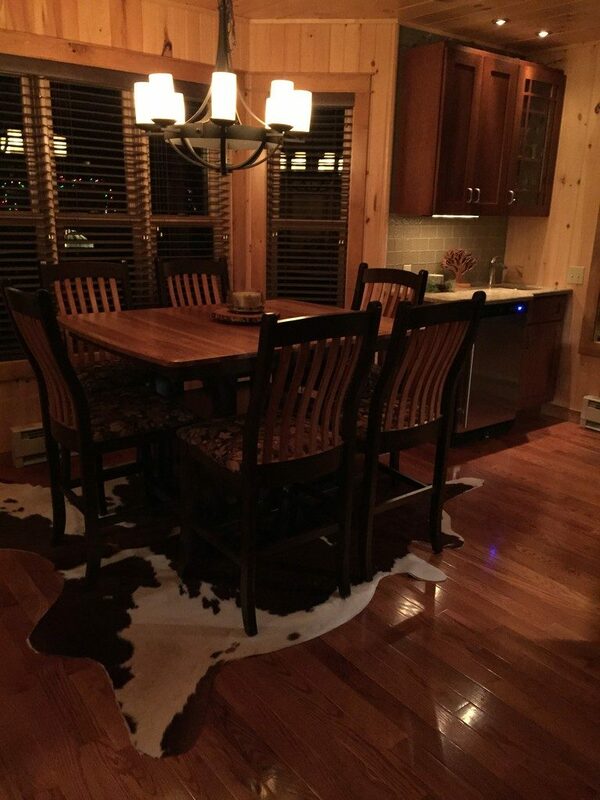 “Laura worked with me over the course of a few weeks, helping me to select a table and stain. My emails and phone calls were always responded to quickly, providing me with the information I needed. “I knew throughout the process that the table would be beautiful, but when it arrived I was pleasantly surprised to find that it went beyond my expectations. The quality of the wood and the workmanship are extraordinary. 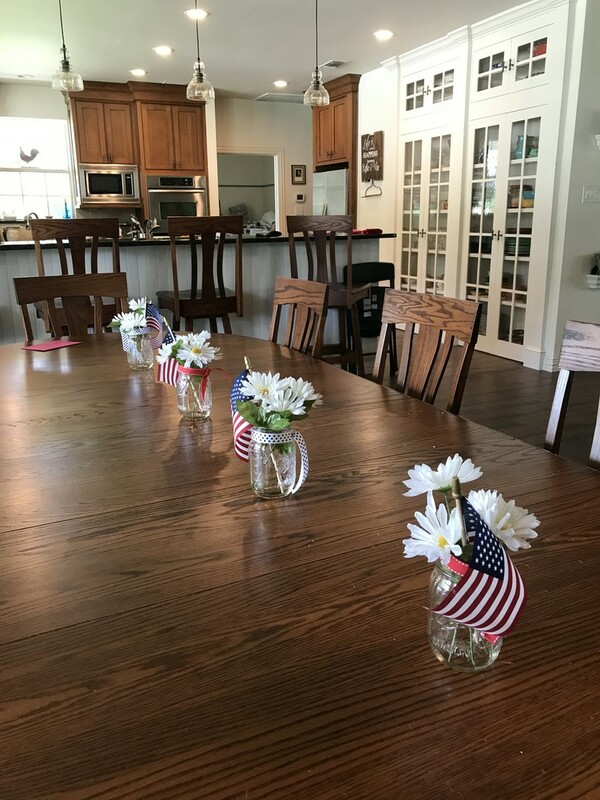 We are extremely happy with the table and would not hesitate to order furniture again from the Amish Furniture Factory. 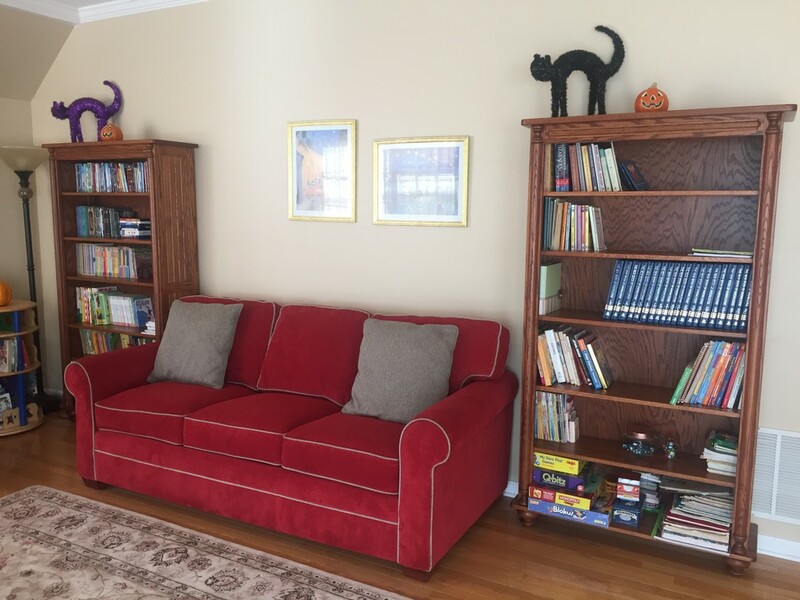 “Laura, our furniture arrived at our vacation home in perfect condition and we are thrilled. We just love the table with the beautiful butterfly leaf and the 6 chairs. 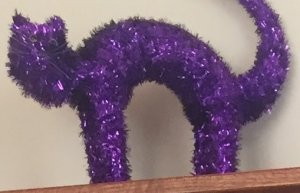 We have received many complements and hope to order a similar one for our (main) home. This dining set has a two-tone finish. To see our Mason Double Pedestal Table while it’s still in stock, click here. For the Gatlinburg Dining Chairs, click here. 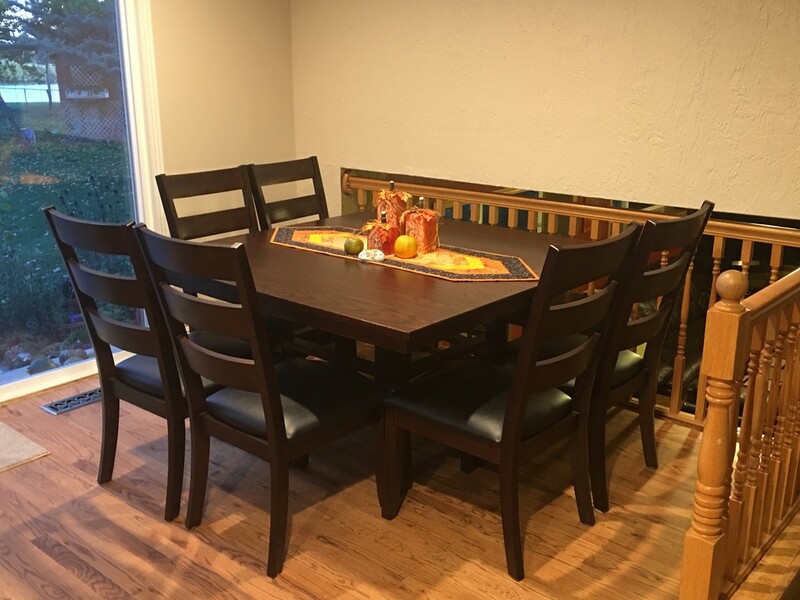 The Dilling Family is proud to own this beautiful dining table, chairs and bar stool. 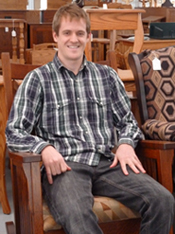 Working with the Amish Furniture Factory was easy, there was continued communication throughout the building process. The result is better than I could have imagined. 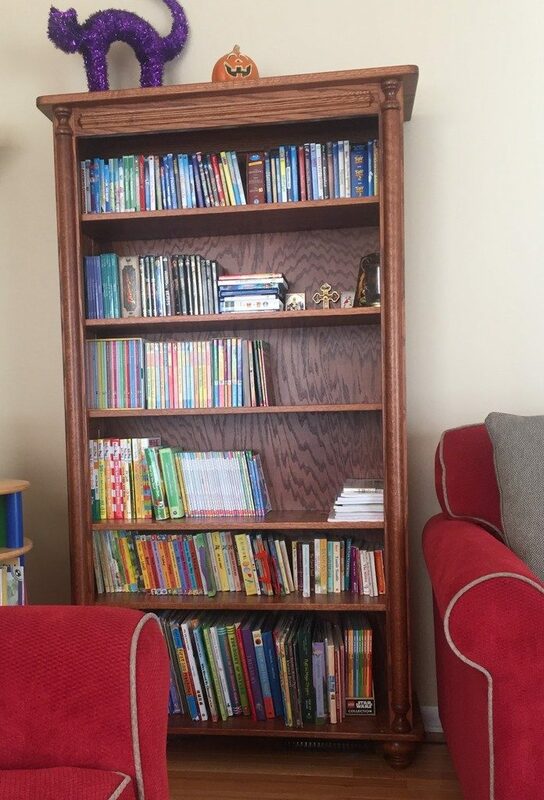 Says Marie: “We are still settling into our new house, but I wanted to send you some pictures and tell you how happy we are with our purchases from Amish Furniture Factory. 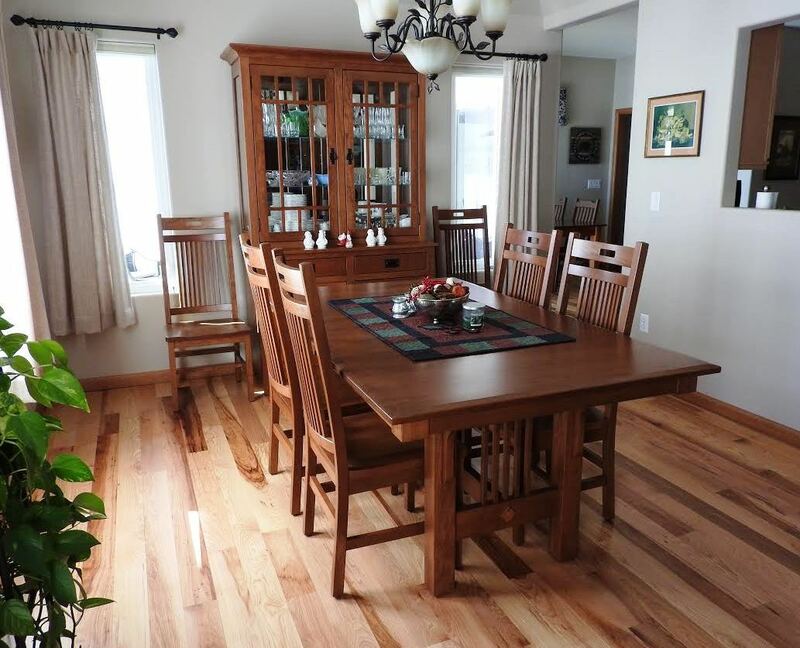 “My favorite is all of the cherry we purchased for our living and dining rooms. 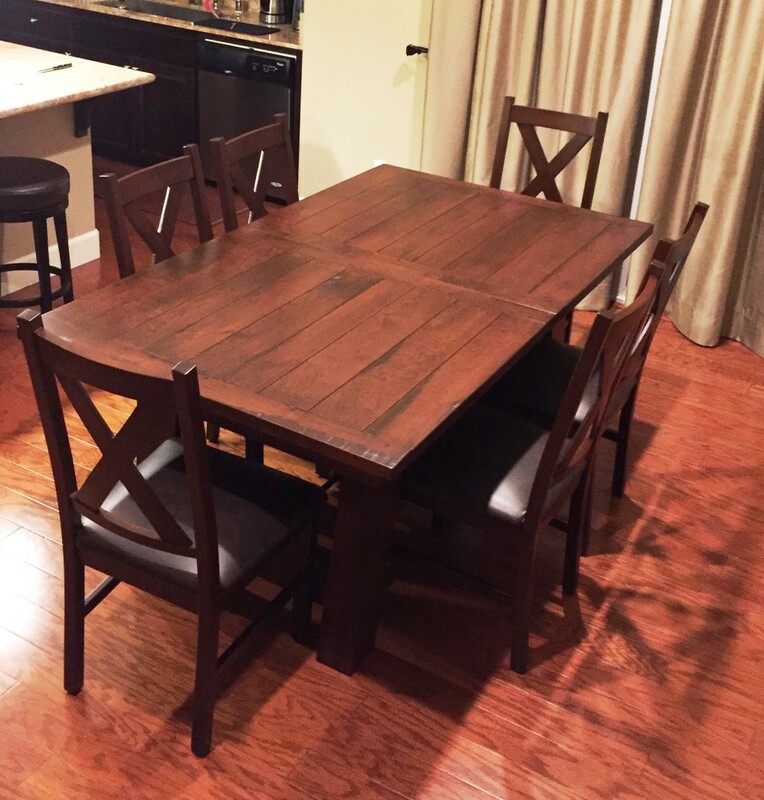 “I’ve owned a number of pieces from some of the top furniture manufacturers and I can honestly say none of them compare to the quality of the pieces we purchased from AFF. 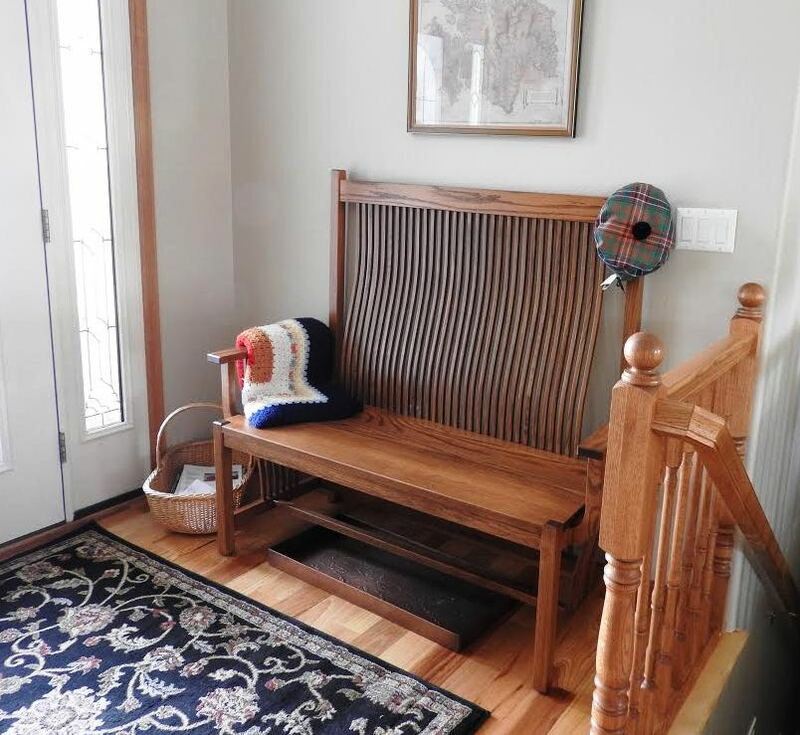 Great attention to detail, superior craftsmanship, and all solid wood! 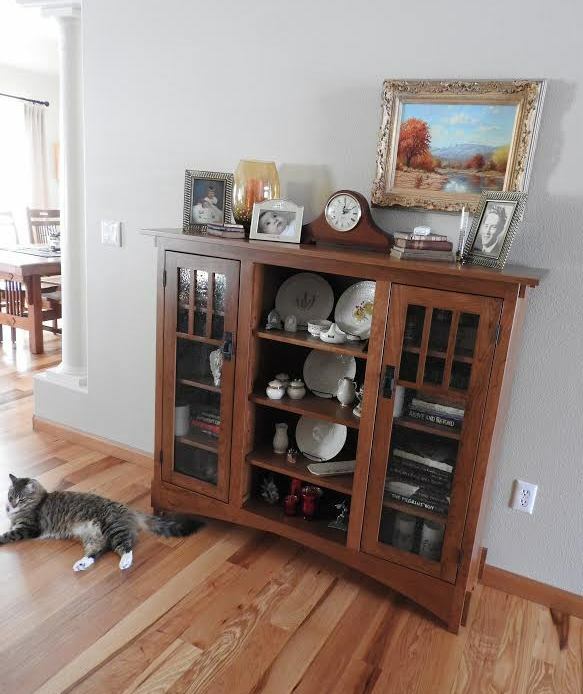 Mission Display Bookcase in cherry with Baywood stain, and a cat. In total, Marie purchased eleven pieces of solid wood furniture! So we’re glad it’s rewarding.